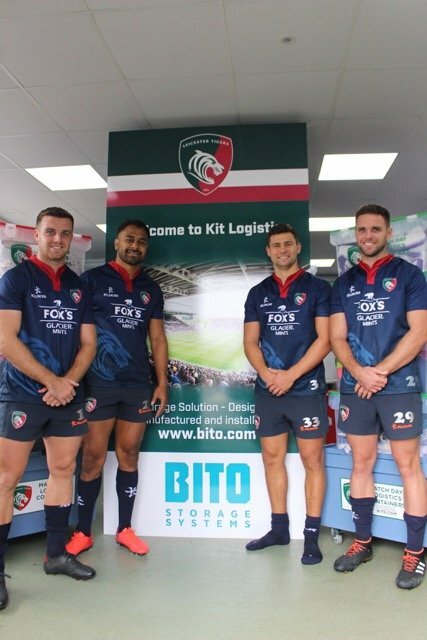 BITO Storage Systems has supplied Leicester Tigers Rugby with a fleet of match day logistics containers as part of its kit logistics solution, which has dramatically improved logistics operations from the club’s Oval Park training ground. A complex inventory of kit and gear is involved in today’s Rugby Union – far removed from the old days when the kit manager brought along a bag full of shirts, with a bucket and sponge for the medical department. “I get through about 10,000 items of kit per season,” said Clive Galloway, Kit Manager at the Leicester Tigers. This typically includes playing kit, training kit, water-proofs, plus all the medical items such as painkillers, tapes, nutritional supplements, food and drinks for players’ dietary requirements, and stretchers. All of the Tigers’ equipment is stored at the club’s Oval Park training ground where players spend most of their week, and is home to the club’s medical and conditioning facilities. Moving kit around the facility and particularly when transporting it to venues on match days – whether for an away match or to the Tigers’ famous home stadium, Welford Road – was a slow and cumbersome task. “Everything was in fabric kit bags, which were often overloaded making them hard to lift and store. We could only carry a couple of kit bags to the delivery van at a time,” added Clive on the logistical challenge he faced. This caught the interest of long time Tigers fan Edward Hutchison during an open day at Oval Park, when he chatted to Galloway about some of the match day logistics issues faced by the club. Hutchison, who happens to be Managing Director of Nuneaton-based BITO Storage Systems, a company dedicated to providing storage and order picking solutions, saw how this operation could be improved significantly using BITO’s sturdy and stackable plastic containers. This experience led to BITO providing Tigers with a fleet of containers and transport dollies in two sizes: 600 x 400 mm footprints and larger 800 x 600 mm units from its MB range of plastic containers as part of a kit logistics storage solution. The containers were supplied with three different coloured lids using the Tigers’ team colours to indicate clearly what’s inside: a green and red lid means the container houses players’ kit; plain red designates medical items while green-only lids house conditioning equipment. In addition to having clearly displayed labels always on show, this system makes it very easy for the kit, medical and conditioning teams to each quickly find their own equipment when it is being offloaded at the match ground. At the training ground, BITO installed shelving to house the containers, which has transformed the way the kit is stored, making access to and putting away much simpler and saving space that can be put to use for other purposes. Security is vital in professional sport, not only to avoid valuable kit going missing when it is needed most, but also for traceability. Anything that is consumable needs to be managed by the Tigers’ medical department for drug test batch traceability. The containers are lockable with either temporary clips or padlocks, allowing the team to safeguard what is dispensed, thus ensuring that supplements or drinks are not tampered with. This is a further reason why the medical team is delighted with the new BITO system.